The Marche region lies between the Adriatic and the Apennines in central Italy. In this multi-faceted landscape, countless well-preserved testimonies of a very rich history can be found. Of particular note here is the former Duchy of Montefeltro, with its center Urbino, where in particular under Federico da Montefeltro in the 15th century epochal was created. The background for these cultural achievements was the old family feud with the Malatesta of Rimini, which Federico da Montefeltro was able to finally win by using all means. As a successful Condottiere (army commander) for Italian cities and especially for several popes, he had the necessary means for self-expression and was able to profile himself as a patron. The river Foglia was for a long time the border to the lands of the Malatesta. Fortified villages and fortresses still bear witness to it. Outstanding and worth seeing is the 'Rocca Ubaldinesca', which Francesco di Giorgio Martini 1475 due to 'alchemical considerations' gave the shape of a turtle. In the years 1942-44, thousands of Italian masterpieces were hidden here. 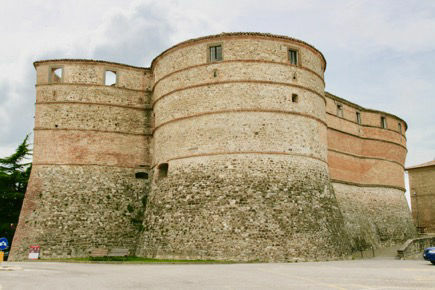 The Rocca is home to several collections and houses a cute 19th century theater. Front line was the valley also during the Second World War, here ran the 1944-45 hard-fought Gothic Line (Linea Gotica). 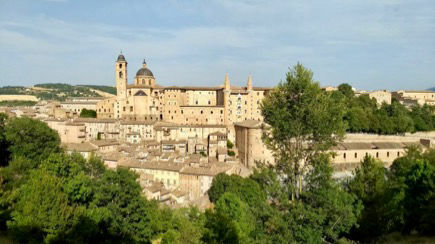 One of the culturally leading cities of the Renaissance, Urbino was classified as a World Heritage Site in 1998 for the cityscape and the Palace. Renowned artists such as Piero della Francesca, Francesco di Giorgio Martini and Raphael's father Giovanni Santi worked here. The painter Raffaello was born here, his birthplace can be visited. A highlight is the visit to the Palazzo Ducale, a masterpiece of the Renaissance. Among other, artworks of the above mentioned artists are exhibited. The foundations of the city were set by the Romans, possibly even earlier. This lively town is idyllically situated in a loop of the river Metauro. It was significant for centuries for majolica ceramics. Several artisans follow this tradition. The Palazzo Ducale houses a collection of faïence, geographic documents, including 2 Mercator Globes and an exhibition on local farm life. Attraction is also the church "Chiesa dei Morti", where 18 local mummies await visitors in the priestly order. 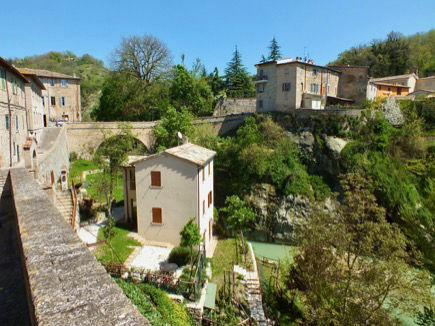 Just 15 km from Ca 'Agostino, Urbania can be reached by experienced cyclists with our bicycles. In the 3rd century, the missionaries Leo and Marino reached the Mons Feretrius. The name changed over time to Montefeltro and then referred to the area. 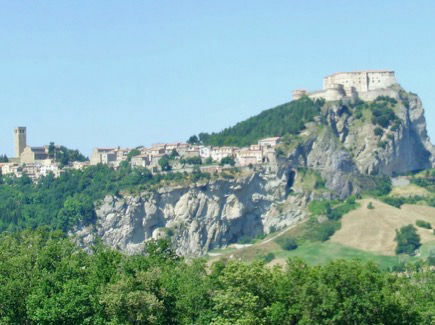 In 1155 Montefeltrano, the first member of the rising aristocratic family was recorded in San Leo. 1226 they were then awarded by Emperor Frederick II with the county Urbino. The Vatican used San Leo as a prison and "housed" from 1791 until his death in 1795 under the worst conditions the alchemist, rascal, doctor and Mason Giuseppe Balsamo, Alias Conte Cagliostro for a lifelong sentence for heresy. The 9th-century Basilica and the 12th-century San Leone Cathedral are also worth a visit. * Pesaro, our capital, is a popular seaside resort, but above all known as the birthplace of the composer Gioachino Rossini. The -> Rossini Festival takes place in August. I would like to show you here a compilation of the primary highlights of our region. Use these especially for travel preparation. The Via Flaminia, an important link of the Romans led Rome via Cagli to Fano. Many bridges and tunnels still used today, testify to the high architecture of the Romans. Along this route are many monuments to discover. Our capital, Pesaro, popular as a seaside resort, is best known as the birthplace of Rossini; a magnet for visitors is the Rossini Festival in August.